Dwight Hopkins, Ph.D., will present an African American History Month lecture, “What is a Christian Black Theology of Liberation?,” on Monday, Feb. 8, at 7 p.m. in Weyerhaeuser Hall’s Robinson Teaching Theatre at Whitworth University. This lecture is open to the public, and admission is free. For more information, please call (509) 777-4215. In this presentation, Hopkins will examine the historical perspectives of the African American Church and trace the connections of black liberation theology to the Bible, and to Jesus, justice and race. Hopkins’ books will be available for sale during the evening, and a brief book signing will follow his lecture. 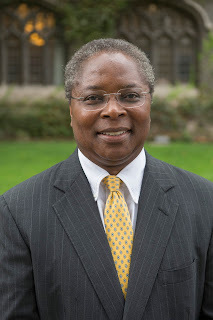 Hopkins is a constructive theologian working in the areas of contemporary models of theology, various forms of liberation theologies (especially black and other developing-country manifestations), and East-West cross-cultural comparisons. An author and ordained American Baptist minister, Hopkins is professor of theology at University of Chicago Divinity School and professor extraordinarius at the University of South Africa (Pretoria) in the department of philosophy and theology. He earned his doctoral degrees at Union Theological Seminary and University of Cape Town. He is the founder of a 14-country network that strategizes constructing healthy communities and building bridges across global cultures, and he is the author of a number of books, including Shoes That Fit Our Feet: sources for a constructive black theology and Being Human: race, culture, and religion.